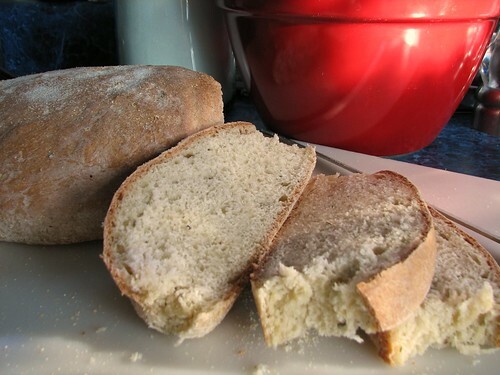 We have been making our own bread long enough that we would never think of going back to store-bought. If we do buy store-bought, it’s because we have a house full of company and that’s what they prefer. (Hard to believe, but there are some people out there who do not know what they’re missing!) DD wouldn’t make a sandwich one day because, while there was half a loaf of store-bought bread, there wasn’t any “real bread.” Her words. Once in a while I try my hand at a different bread recipe and this week I tried biga bread. 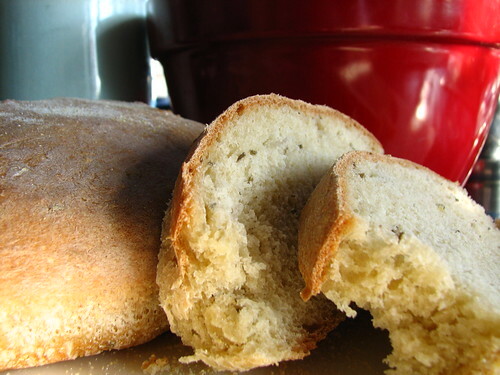 It makes a wonderful rustic Italian bread. Hearty and chewy. So good! I baked the dough as two free form round loaves on a baking sheet. This is very easy to make. I hope you’ll give it a try. I found the recipe on Heart of the Matter where it was posted by Hannah. It is also on Hannah’s blog Cultivating Home. The bread is made over the course of two days. The first 18-24 hours allows the biga (the starter) to develop. This gives the bread its chewy texture and wonderful flavor. It also helps the bread slice easily and store well. Cover and leave on the counter overnight. The next day, cut the biga into eight or ten pieces. This will make it easier to incorporate it into the dough. I also added 1 tsp. finely chopped rosemary leaves, 1 tsp. crushed oregano, and 1/4 tsp. garlic powder…not in Hannah’s recipe. You can add some whole wheat as part of that, if you like. Mix to make a tacky but not sticky dough. Knead on a low speed for six or seven minutes. I scraped the sides of the bowl down, sprayed the top of the dough with cooking spray, and covered it with a cloth. That’s my usual modus operandi for bread dough. Why put it into another bowl just to rise? Allow to sit until doubled in size. It may rise more slowly than bread made without biga. Mine was ready in about 80 minutes, though, if I hadn’t been in a time crunch for supper, I would have let it sit a while longer. BTW, if you bake a lot and don’t have a King Arthur Flour bowl scraper, you need to get one. I love mine!! Prepare a baking sheet lined with parchment paper (or a baking stone) by sprinkling it with corn meal. Form the bread into any shape you like. It makes two lovely round loaves. Sprinkle the top with poppy seeds, cornmeal, or anything else you like. Or leave plain. The bread can also be formed into loaves and baked in loaf pans. Spray the pans well with cooking spray and/or line them with parchment paper. Slash the top of the loaves, if you like. I didn’t and it came out fine. Let the dough rise until doubled. Preheat the oven at 475. Reduce the temperature to 400 just before the bread is placed in the oven. Bake until done. Ours was ready after 30 minutes, though the recipe I followed said it would be 40-45 minutes. We used an instant-read thermometer to check the temperature. 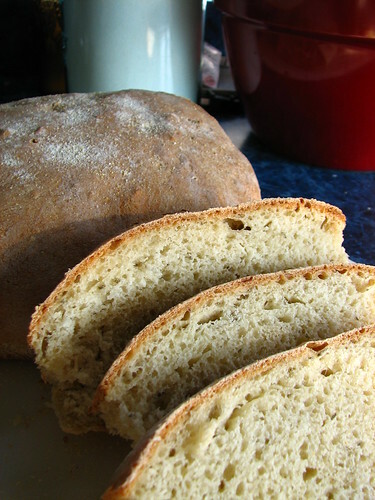 Bread is done when the internal temperature reads 190 – 200. Let the loaves rest for ten minutes before removing from loaf pans to cooling racks. Enjoy! This entry was written by ~~Rhonda, posted on February 16, 2011 at 11:34 pm, filed under cooking. Bookmark the permalink. Follow any comments here with the RSS feed for this post. Post a comment or leave a trackback: Trackback URL.